During a recent episode of Man v. Food, host Adam Richman visited the city of Syracuse, the city I call home. Though, admittedly, I don’t regularly watch Man v. Food, I recorded this episode, since I’d heard there would be a segment featuring one of my favorite places, Dinosaur BBQ. And there was. But the segment which really caught my attention featured a place I haven’t been to, called Mother’s Cupboard, home of the six pound frittata. You heard me right. Six. Pound. Frittata. Now this frittata is not like any frittata I’ve ever seen. If I had to guess, I’d say that about 5.95 pounds of it is composed of the fillings; sausage, peppers, onions, pepperoni, and a full pound of potatoes. The entire pile of food is bound together with 4 scrambled eggs and served with 4 ends of Italian bread. Don’t get me wrong. I LOVE to eat and I have a very healthy appetite, but watching Adam Richman eat that entire mass of food turned my stomach just a bit. The small percentage of diners who do manage to eat the entire meal, as Mr. Richman did, get a T-shirt and their picture on the wall. I don’t think I’ll be attempting the challenge anytime soon, but it was sure fun to watch. I like frittatas quite a bit and don’t make them nearly enough. 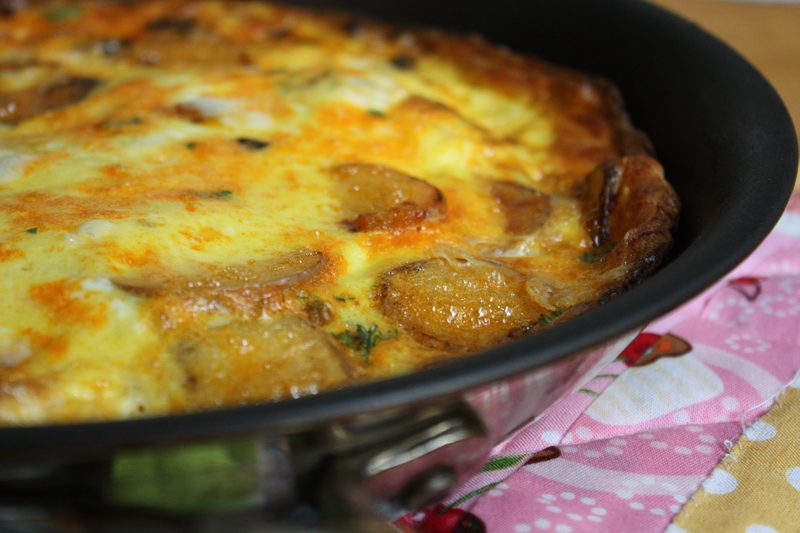 Frittatas are an egg dish, similar to an omelet, filled with any combination of ingredients and typically finished in an oven. Once you’ve got the idea, the possibilities are infinite. They make a great breakfast, lunch, or dinner. They’re also perfect for using up leftover vegetables, cheese, or meat. 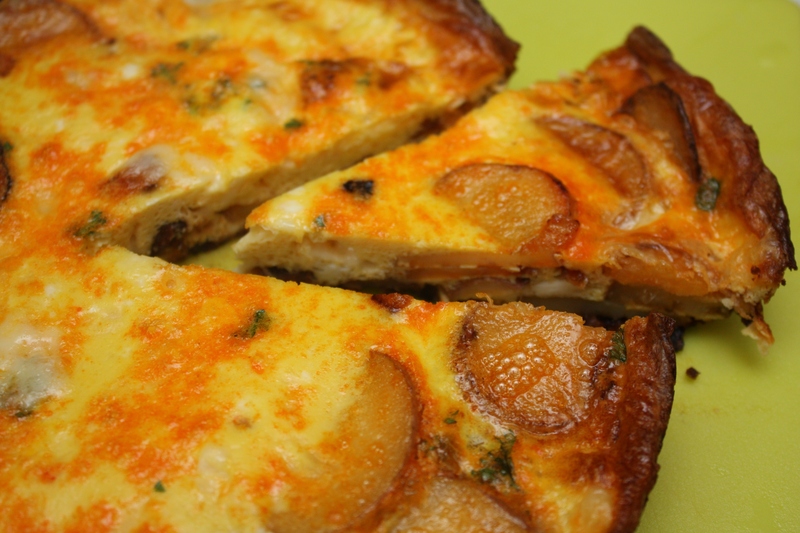 For my frittata, I made use of some chorizo I’ve been storing and a few potatoes I purchased for another meal. The potatoes get cooked with the chorizo and a bit of chopped onion. 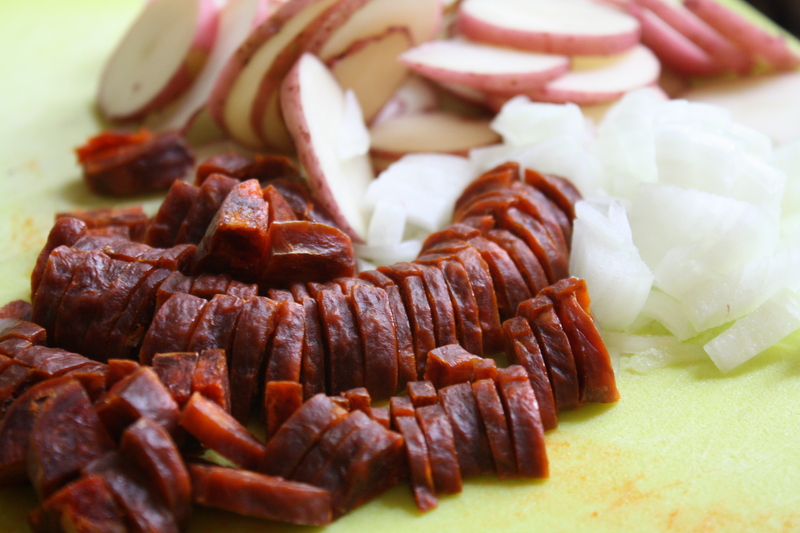 As the chorizo cooks, it releases its tasty flavor to coat the potatoes. Once the potatoes are tender, the egg mixture gets poured over the fillings, cooked for a few minutes on the stovetop (try not to burn the bottom like I did), then placed in the oven to finish. A bit of melty Fontina cheese adds the finishing touch. Preheat oven to 425 degrees. Spray an oven-proof skillet with cooking spray. Heat the pan over medium heat. Add the chorizo, potatoes, and onion. Cook for about 10 minutes, stirring frequently, until the potatoes are tender. In a bowl, whisk together the eggs and milk. Season with salt, pepper, and fresh parsley. 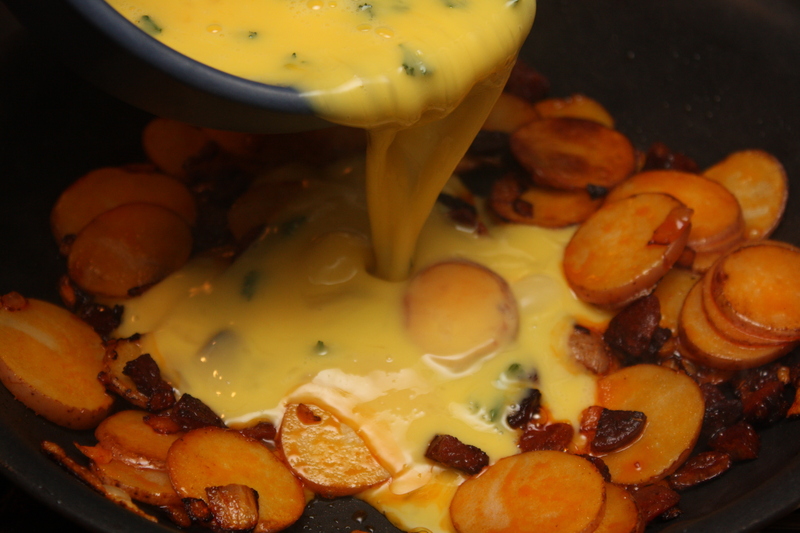 Once the potatoes are tender, pour the egg mixture into the pan. Cook for a couple minutes until the eggs appear cooked around the edges. Sprinkle the fontina cheese over the egg mixture and place the pan in the oven. Cook for 10-15 minutes until the eggs are completely cooked through. The top will appear golden brown and the center should look a bit puffy. Posted in Breakfast, Cheese, Eggs, Food, Main Course, Recipes and tagged adam richman, cheese, competitive eating, Cooking, Eating, eggs, food photography, frittata, Man v. Food, Recipes, syracuse. Bookmark the permalink. I am quite disappointed now that we are dining out this evening as this recipe will now have to wait until tomorrow. I will pair this lovely meal with a crispy green salad dressed with a balsamic dressing. I would love to cook this… Could you suggest a good vegetarian option to replace the chorizo? I’m not sure if there is a vegetarian substitute for spicy sausage. But this recipe would be delicious with some roasted vegetables (mushrooms, squash, peppers) thrown in! I love roasted veggie frittatas! this looks wonderful! 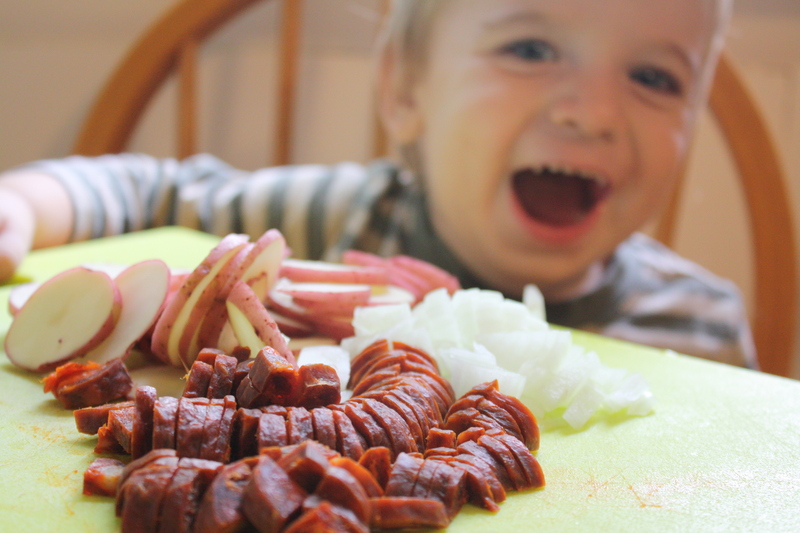 Your little taste-tester is a cutie! Looks lovely. We can’t get chorizo here in Turkey so if we make anything like that, we use sucuk which is a similar sausage but made from beef. Never thought of finishing off in the oven before. Will give that a try.